"PIECES Gem 02 NEURO HARD" in [PIECES] was updated. "The New Movie" and "Arise Alternative Architecture" were added to [Ghost In The Shell]. "PIECES Gem 02 NEURO HARD" was added to [PIECES]. "PIECES Gem 01 GITS DATA + alpha" was added to [PIECES]. "BUKYO-GAKUEN" was added to [Novels]. "ID7 BARB WIRE 02" in [INTRON DEPOT] was updated. "SABER TOOTH CATS 6" was added to [Calendar]. "ID6 BARB WIRE 01" and "ID7 BARB WIRE 02" were added to [INTRON DEPOT]. "- A STRANGE PRESENCE -" and "- DELUSIONWORLD -" were added to [W・TAILS CAT]. "BORDER BREAK mobile - GunFront Gale" was added to [Games]. "Social Network Game" was added to [Games]. [THE GHOST IN THE SHELL] page was created. [W-TAILS CAT] page was updated. "BEPPIN DMM Feb. 2013" was added to [Interviews]. [Calendar], [PIECES], [TOGIHIME ZOHUSHI], [EXON DEPOT], and [W-TAILS CAT] were updated. [W-TAILS CAT] page was created. "PIECES8 WILD WET WEST" was added to [PIECES]. "Canopri Nov. 2011" was added to [Interviews]. "SABER TOOTH CATS4" was added to [Calendar]. "PIECES7 HELLHOUND-01&02 remarks+alpha" was added to [PIECES]. "SINN" was added to [Games]. "2011 Calendar - Ghost in the Shell" was added to [Calendar]. "ID2 BLADES for iPad" was added to [INTRON DEPOT]. "Classical Fantasy Within #4" was added to [Novels]. "EMIL CHRONICLE ONLINE" was added to [Games]. "Classical Fantasy Within" and "C-N25" were added to [Novels]. The page of the game that related to Shirow was newly added. "SNMC 3" was added to [Short Story]. "KOBO Vol.01" was added to [Interviews]. "2007 Shirow Masamune Calendar WORKS" was added to [Calendar]. "TOGIHIME ZOHUSHI" page was created. "DAVINCI July 2006" was added to [Interviews]. "KIKAN-S Spring 2006" was added to [Interviews]. New Domain and New Layout! Shirowledge English Page was started Now! 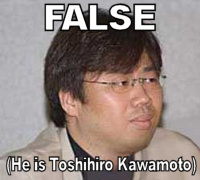 His real name on the right is Toshihiro Kawamoto. He is co-founder and director of the anime studio BONES. "Shirow" is neither last-name nor first-name. 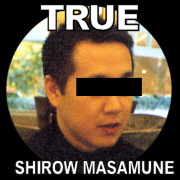 "Shirow Masamune" is his pen name and fixed phrase. Who is Shirow!? Interviews Shirow's NEWS! the Mousepad 2.APPLESEED 3D 3.What's ATLAS!? 4.TANK S.W.A.T. NEWS was moved to blog site in Japanese. If you want to check latest news, please transrate to your language! 2011/10/29 Canopri comic Dec. 2011 GOT 360 MAGAZINE12955-12 Pinup/"W-TAILS CAT"
2011/11/29 Canopri comic Jan. 2012 GOT 360 MAGAZINE12955-01 Cover/Poster/"W-TAILS CAT"
2011/12/29 Canopri comic Feb. 2012 GOT 360 MAGAZINE12955-02 "W-TAILS CAT"
2012/01/28 Canopri comic Mar. 2012 GOT 360 MAGAZINE12955-03 Cover/Poster/"W-TAILS CAT"
2012/09/29 Canopri comic Nov. 2012 GOT 390 MAGAZINE12955-11 Cover/BackCover/Poster/"W-TAILS CAT2"
2012/10/29 Canopri comic Dec.2012 & Jan.2013 GOT 390 MAGAZINE12955-01 BackCover/"W-TAILS CAT2"
1996/07/25 GHOST IN THE SHELL - PREMIUM BOX LD 14,800 BEAL-921 Bandai Visual 2 LDs + bonus LD "GHOST IN THE SHELL DIGITAL WORKS"
05/25 Shirow's collection BLACK MAGIC (second edition) L.COLLECTION 3 (fanzine) A5 Atlas cover differs from the first edition. postscript is added. 1988 07/01 SPECIAL GRAPHIX DOMINION COMICOMI special A4 Hakusensha "Tank Police PHANTOM OF AUDIENCE"
07/22 "GITS2 MANMACHINE INTERFACE 4.LOST PAST" YOUNG MAGAZINE 33 B5 Kodansha "BOOK in BOOK" spec. 07/11 GHOST IN THE SHELL Cyberdelics (goods) - Kodansha poster etc. 12/22 KOKAKU SOLID BOX (Goods) - Kodansha GITS, MMI, clear FUCHIKOMA, Posert, etc. 10/?? Shirow Masamune Clear-Folder Set (goods) A4 CROSSROAD The mail order of this was carried out together with the calendar. 10/20 Shirow Masamune Clear-Folder Set 2 (goods) A4 CROSSROAD The mail order of this was carried out together with the calendar. 2009 02/23 PIECES 1 (Art Book) A5 Seishinsha include: "EXON DEPOT", "Jashin Hunter" and etc. 04/26 W-TAILS CAT - A STRANGE PRESENCE - Episode 01 (Stream) - W TAILS CAT PROJECT X-rated contents "W・TAILS CAT -DELUSIONWORLD- Viol.1"
09/20 INTRON DEPOT 6 BARB WIRE 01 (Art Book) A4 Seishinsha works of "Classical Fantasy Within #1~#5"
11/22 INTRON DEPOT 7 BARB WIRE 02 (Art Book) A4 Seishinsha works of "Classical Fantasy Within #5~"
01/25 GREASE BERRIES 1 (Art Book) B4 GOT Illustrations of cover & poster from magazine "CANOPRI Comic"
10/25 GREASE BERRIES 2 (Art Book) B4 GOT Illustrations of cover & poster from magazine "CANOPRI Comic"